We’ve got a new glimpse at what an Honor 8 successor could look like. We have an Honor 8 unit here at the office and are going to be comparing it directly to this render to call attention to a couple of things. Let’s start with what’s different (which there doesn’t appear to be much of): The fingerprint scanner has a new location, right under the display and takes the same shape as the one found on the Huawei P10. Next, the way the light hits the back of the glass suggests it may be tapered at the edges for improved ergonomics. This can also be seen on the front, but the curve appears to be much more subtle. If Honor was to move the fingerprint scanner to the front, there would no longer be a “Smart Key”, something that was a huge selling point on the Honor 8. The smart key is there to program to whatever you’d like, including actions like taking a shot, firing up the flashlight, or launching an app. As legitimate as the render looks, we can’t help but be a bit skeptical about the placement of many of these sensors. After carefully inspecting the leak and this physical unit, it’s likely that this leak is a phony based on our observations. The dual camera setup, front-facing camera, earpiece, and proximity sensor are all placed identically to the Honor 8, there isn’t even a huge difference between the appearances of the sensors. Another discrepancy we have is the appearance of the volume and power keys. Just like above, they’ve been virtually untouched. There is some text at the bottom of the rear glass, but it isn’t legible and in Chinese. 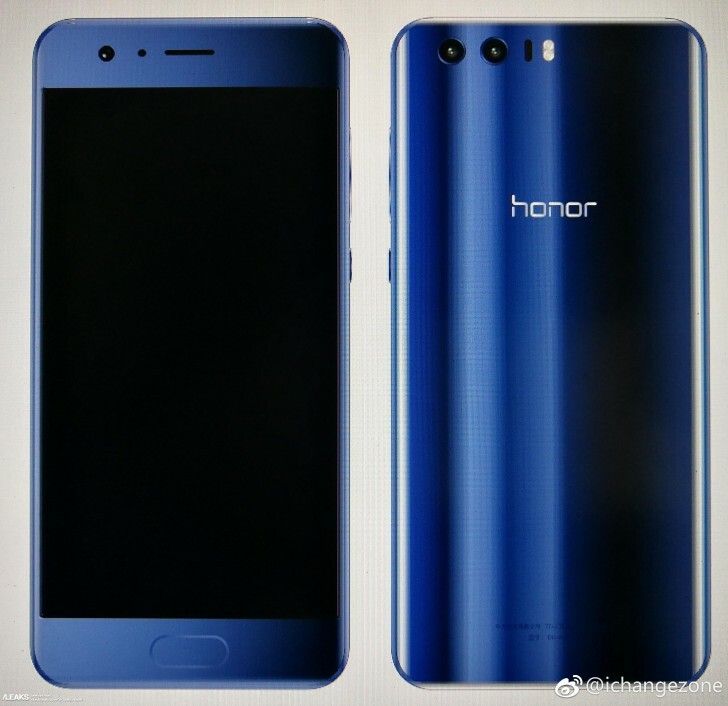 As we go down list, we are more inclined to believe one of two things: either this leak is a fake, or this render (if it is a real one) isn’t representative of a new Honor 9, instead it could be another variant of the Honor 8, perhaps one meant for emerging markets with a more entry-level processor and less RAM. While we’re at it, it probably wouldn’t have an IR-blaster either. What’s your take on this leak? Tell us your thoughts, but not before checking out the full-res version of the leak at the source link.